CBD for dogs has shown to be a powerful natural healing compound for dogs of all ages. Now that more dog owners are seeing positive effects of cannabidiol (like how CBD can reduce lymphoma in dogs & prevent seizures), only one thing remains up for debate — how to properly calculate the optimum CBD dose for your four-legged friend. The first step in determining the correct dose for your dog is to use our handy CBD Dosage Calculator. 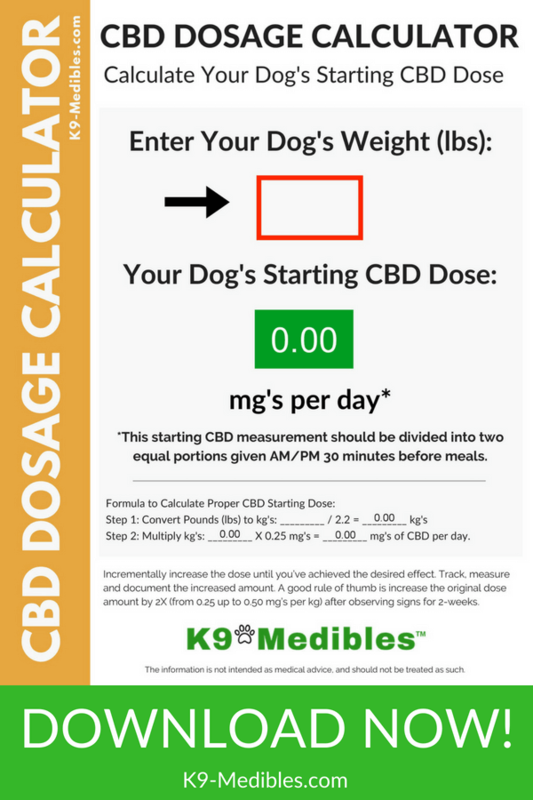 It’s simple, with just one step you’ll know the precise starting dose amount of CBD (mg's) based on your dog's weight. Here's where to get started -- Download a FREE CBD Dosage Calculator. Our CBD Dosage Calculator is designed to make it easier for you to calculate the starting milligrams of CBD for your specific dog's weight. Simply enter your dog's weight in pounds and hit enter for the calculator the deliver your results. Simple. Easy. Precise. Instantly calculates your dog's starting CBD dose. CBD drops placed under your dog's tongue (sublingual) are the most popular form of giving CBD oil. But bottle sizes and potency differ across brands. So figuring out how many milligrams you should give your dog can be confusing--even for those who are good at math! ​Our CBD Dosage Calculator is designed to make it easy for you to calculate the amount of CBD needed to achieve your dog's proper daily dosage. Discover your dog's CBD 'sweet spot' with accurate, responsible dosing. PRO TIP: The trick is to get the initial dosage right and then incrementally increase the daily amount over the course of several weeks. The short answer is, there’s a dosing range that is recommended to start with and it’s best to begin at the low end of this range. A good starting dosage is based on your dog's body weight using a milligram to kilogram (mg/kg) benchmark. Start with a minimal amount of CBD (0.25 milligrams) per kilogram of canine body weight. This starting CBD measurement should be divided into two (or three) equal portions given throughout the whole day. Make sure to keep an eye on him for a few hours after you first administer CBD paying particular attention to the effects it has so you know how to adjust the dose to maximize the benefits. After a week, incrementally increase the dose with additional milligrams until you’ve achieved the desired effect for whatever is being treated. Again, track, measure and document the increased amount. A good rule of thumb is increase the original starting dose amount by 2X (from 0.25 up to 0.50 mg's per kg) after observing signs for 2-weeks. Remember, a lot of different factors can influence the exact dose of CBD your pet needs. What's most important is to be consistent and steady with your daily CBD delivery. Getting that fine balance is crucial, as high-quality CBD oil for dogs can be quite costly, so you don’t want to give your dog more than it needs. CBD is more a 'Dog Specific' support than a 'Disease Specific' supplement. So the application of CBD to any situation or clinical diagnosis is still centered primarily on the weight of your dog and it's reaction. Using this CBD Calculator will help you figure out the optimum CBD starting dose for your dog. If after giving your dog a tiered amount of CBD (over a two week or month period) and you still don’t see the results you want or expect, just know that not all dogs respond the same–even to the same CBD source. Be aware that a different CBD may provide the long-lasting relief you and your dog were seeking. It may take two or three trials of different CBD products over a three to six month period to hone in on the best source for your specific dog. Discovering the optimum dosage for your dog is like trying to hit a moving target – but with diligence and patience you can find your dog’s unique CBD dosage Sweet Spot. Sublingual application is more easily adapted for dogs because canine patients need only a small amount of CBD to deliver a significant therapeutic-effect. Hemp CBD oil has medicinal qualities for dogs and its dosing should be carefully calculated. It’s important to know the concentration of CBD in milligrams for one’s own pet. Once you have your basic CBD Dose calculation in hand, you can begin the process of creating a measurable, workable framework for healing your dog naturally -- And hopefully generate a lifetime of canine well being!